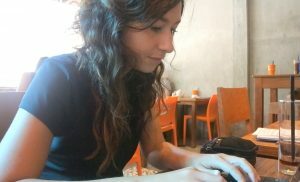 One month ago, I started the co-working journey in Hoi An, Vietnam. I like to find cafes where I can work, but sometimes it’s nice to have co-working space. Not only to get my work done but also to meet like-minded people and to feel inspired by other stories. 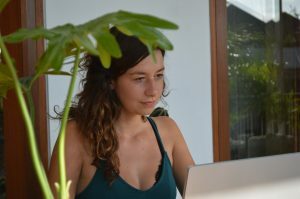 In this blog, I will share my personal experiences with the Hub, my co-working place in Hoi An. 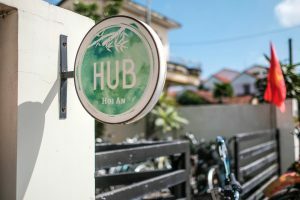 There is one co-working place in Hoi An, named the Hub Hoi An. The workspace is open 24 hours, they have a meeting room, a quiet room and an airconditioning room. You also can work in the garden. There is a printer, monitors and free water and tea. You also have different discounts when you’re a member. (discounts on yoga, sports and massage places). When you go for the monthly pass, you can have one free drink a day. 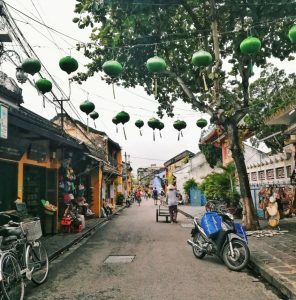 I also wrote a digital nomad guide with everything you should know if you’re thinking about working as a digital nomad in Hoi An. The guide also involves information about everything you should know when you consider living there for a while, so check it out! The costs are depending on how many hours you would like to spend in the coworking space. You have a couple options in the Hub. A day pass, a week pass (8 days) and a month pass. The payments can be in cash (dong) or with your credit card. 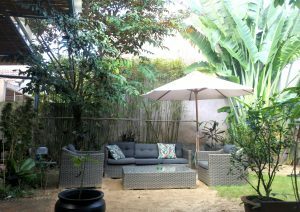 There is a meeting room, a quiet room, workspaces outside, a garden table and an airconditioning room. The wifi is strong, 60 MPs and reliable. I really liked the coffee and the food in the restaurant offers vegan options and healthy as well. The reception hours are only till 5, so you will get a key for 24 hours access. It’s also nice that there is free water and tea. -There is a strong community feeling. What I liked about this place is definitely the community feeling. After work, I regularly eat with people from the place, had some business opportunities and love the fact that everyone was really open and in for a chat. – There are a lot of weekly events. Like yoga, teaching classes, game nights and weekly dinners. 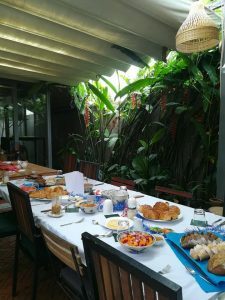 When I was there the Christmas brunch was definitely a highlight. 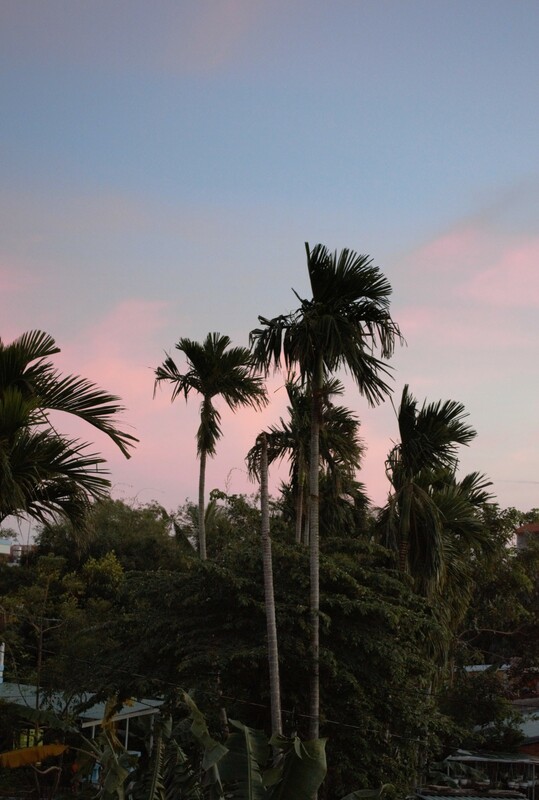 – Life in Vietnam is quite cheap & it’s nicely located. 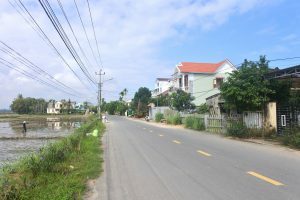 The Hub is close to the beach, just a 10-minute bike ride from the city and 45 minutes from Danang. 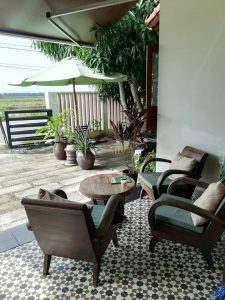 It’s a perfect place to work when you’re travelling in Vietnam or just need a place to stay for a while to save some money. – There are no skype boots, only a meeting room, but sometimes it’s already reserved and then you don’t have other options. – The chairs aren’t that comfortable. 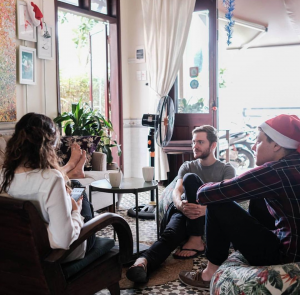 – In my opinion, it’s too expensive for what you get compared to other co-working spaces over the world. – I miss flexibility in the passes, There is no 3-day pass or a pass for internet use an hour. – They didn’t organise getaways or something to explore the area with the members. – The cafe is closed on the weekends and during the day only open till 4 pm. – The cafe was a bit pricy in comparison to other cafes. 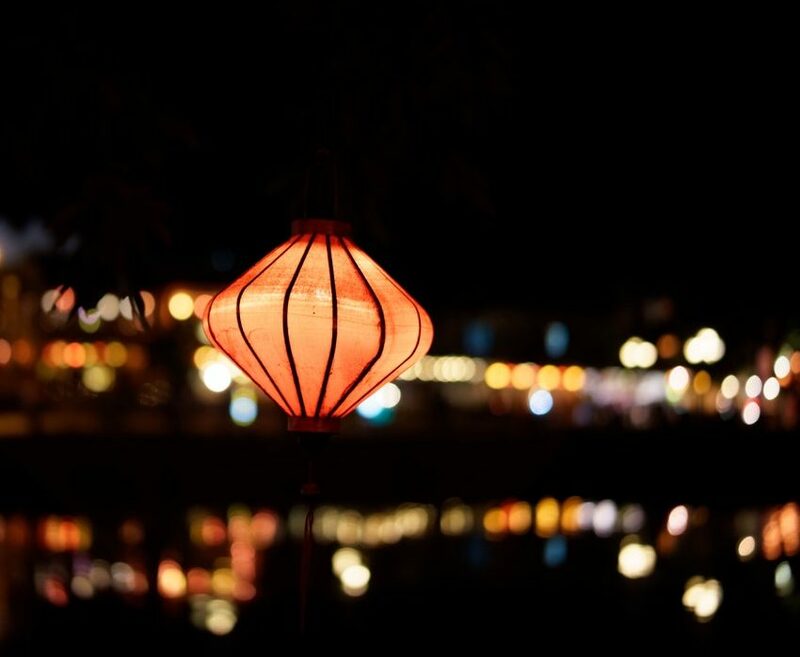 – A personal one, I didn’t like Hoi An that much for long term It’s nice and cosy, but it can be a bit boring after a couple weeks. I worked for 3 days a week, got free accommodation, food during the working days and was able to use the co-working space in my free time. 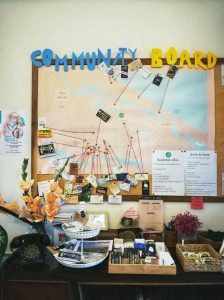 As a community manager, I helped with the coffee making, administration, events and social media. (they got finally over the 1000 followers, glad that I could be part of it to help). I really liked this work and it saved me a lot of fo money! I also liked the fact that I was able to see how everything works. I worked before as an assistant manager in a hotel, so that made this quite easy for me with my previous experiences. But, I learned new skills, a bit of Vietnamese cooking and it was a fun experience overall! Overall, I liked working in the co-working space. The people were really nice, I got 2 freelance jobs out of it and a volunteering job. However, Hoi An isn’t the place for the long term for me. I wasn’t lucky with the weather (I somehow thought it was a good idea to travel there during rain-season.., but mostly because it’s a bit to farmer life for me. I noticed after this month that I like to work in co-working spaces, but not fulltime. I also like to discover cafes and work there. Oh, and don’t forget to check coworker.com if you would like to try out this working space, they offer a free day pass!